Synopsis: Explosive, emotional drama, perfect for fans of Meg Rosoff and Annabel Pitcher.Welcome to Coronation Road - a kaleidoscope of clashing cultures and parallel lives. There's Maggie and her politician mum in their big house. There's Tokes and his mum in a tiny bedsit, running from trouble. And there's the ruthless Starfish gang, breeding fear through the neighbourhood.Amateur film-maker Maggie prefers to watch life through the lens of her camera. In Tokes, she finds a great subject for her new film. And when violence erupts, led by the Starfish gang, Maggie has the perfect backdrop. But as the world explodes around her, Maggie can't hide behind the lens anymore . . .
As part of her I Predict a Riot blogtour, Catherine Bruton talks to ThirstForFiction about “Killing Your Darlings” – ie. killing your own characters as an author! Catherine Bruton’s third novel moves its gaze to more serious situations than her previous novels We Can Be Heroes and Pop!, setting its story in the midst of the London Riots of 2011, on the fictional set of Coronation Road. Maggie is our guide to Coronation Road, and everything we see is (more or less) told through the lens of her camera, with which she’s shooting a film of her home for a competition. Back from her boarding school where her MP mum sends her for the summer, Maggie can’t quite judge the streets and ends up filming a confrontation between seventeen year old Shiv and new boy Tokes who stands up for young troublemaker Little Pea. Tokes’ humiliation of the Starfish Gangleader acts as a catalyst for the events in the novel, which see Maggie, Tokes and Pea quickly caught up in the rising tensions on the streets of London. I Predict a Riot is less gritty than some of the alternatives out there – Alan Gibbon’s novels come to mind – and to all intents and purposes, Bruton is being less political than the latter, responding to character more than Gibbons, whose characters are superb but are straight cut and very real. Bruton, as in her previous novels, lends her characters an air of playfulness that means her novels are more accessible, and there’s definitely a streak of fun that weaves its way through I Predict a Riot, even given its serious subject matter. Even with the older age of her characters – fifteenish – the cast of I Predict a Riot still retain a (realistic) sense of innocence. Tokes is not, as you might expect, a hardened youth. He’s hoping to break free from a life he unwillingly inherited, conflicted by his experience of gang culture and wanting to do his Mum proud. Though in many ways he’s cynical of the world, he’s also freshfaced, particularly when it comes to Maggie. It makes a change that Bruton doesn’t feel the need to turn what Maggie and Tokes have into a full-blown teenage relationship. It’s lovely to see two young characters – for once – become friends and know that they like each other in greater ways, but see them innocently tapping around the subject, exploring each other without having thirty minute make-out sessions. It’s all rather sweet. The star character, however, is neither Tokes nor Maggie, good as they are. It’s Little Pea, whom Shiv has wrapped around his little finger, but who is lovable to the end even though he gets them all into trouble in the first place. He’s an oxymoron of a character, fidgety, dancing and smiling whilst being used, and Bruton gives him a line which really is a descriptor of the whole novel: “I’m a tragic product of a broken society, innit. What can you do?” In many ways, his charismatic self-awareness is what makes I Predict a Riot particularly powerful, and for myself and many others, I suspect, the rhetorical question is not easily answered. 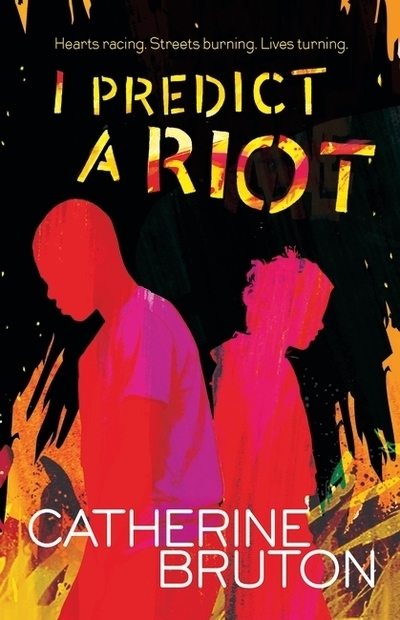 Shorter than both her previous novels, I Predict a Riot is an accessible exploration of gang culture, friendship and second chances that has a cast of lovable characters. With a bittersweet ending, Bruton doesn’t gloss over the hardships but still manages to keep the novel relatively buoyant, making it a powerful and disarming read. And it did, I admit, almost make me cry.